A world premiere heads Birmingham Royal Ballet's summer season, which features new and classic works by the company's artistic director David Bintley. Celebrating 20 years with Birmingham Royal Ballet (BRB), renowned choreographer Bintley has created a brand new dance production - The King Dances. The world premiere of this one-act ballet is just one of the highlights of the new season. It will be staged in a double bill with Bintley's most famous work, Carmina burana. The BRB summer season is performed at Birmingham Hippodrome from June 17 - 27. The King Dances is a piece that re-imagines the origins of ballet from the perspective of the young Louis XIV of France, also known as the Sun King. It has been described as "a visually stunning adaptation" by BRB insiders. Meanwhile, sections of the music from Carmina burana (O Fortuna) will be no stranger to audiences as it has been used for many years as the entrance music for the judges on X Factor. The dance production is however much more dramatic. A scene from Carmina burana from Birmingham Royal Ballet. Carmina burana was the first ballet that David Bintley created for BRB as director. The story revolves around the mythological Goddess Fortuna as she gives three seminarians a major lesson on the fickle nature of fate. Danced to Carl Orff's dramatic and emotionally charged choral music, the three men are forced to abandon their sacred studies but quickly become embroiled with alcohol, passion and love. This is a large-scale production that was Inspired by the satirical writings of medieval priests. The Royal Ballet Sinfonia is joined by Birmingham's Ex Cathedra in the orchestra pit. BRB's summer season also includes the full length ballet of Sylvia. This romantic, time-travelling tale transports audiences to mythical Rome. 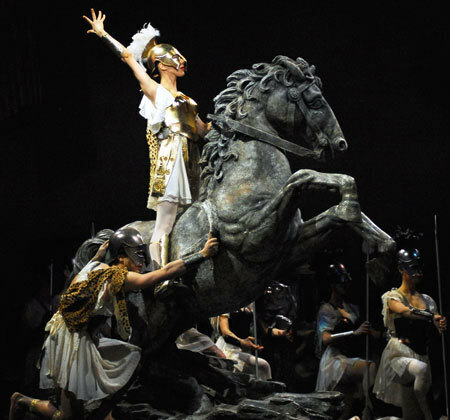 Sylvia is a ballet set in mythical Rome. The storyline sees Count Guiccioli's infidelities cause marital strife between him and his wife and threaten both their anniversary celebration and the burgeoning love between their servants, Amynta and Sylvia. Eros, the God of Love, disguises himself as a gardener in order to step in and reconcile their differences, taking all the characters back to the age of mythical Rome in order to teach them all a lesson about love. David Bintley's time-hopping comedy features music by Léo Delibes, the composer of Coppélia, and a colourful cast of Gods and Goddesses, slave girls and pirates. Interestingly, composer Tchaikovsky was so impressed with Delibes' score, that he wrote his own music for Swan Lake was 'poor stuff' in comparison. Tickets cost from £16 from the Birmingham Royal Ballet website. Tickets cost from £16 to £50 from the Birmingham Royal Ballet website.